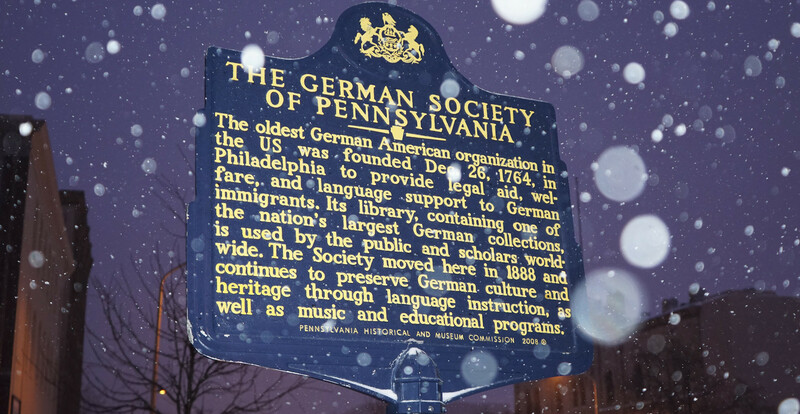 Since its founding in 1764, The German Society of Pennsylvania has served Philadelphia's German community. Between the 1680s and the American Revolution, the majority of an estimated 100,000 German-speaking immigrants coming to North America settled in Pennsylvania, making up a third of Philadelphia's population by the 1760s. These immigrants often arrived in a miserable state after long sea voyages known for unhealthy conditions. In response to their plight, on December 26, 1764, sixty-five prominent German colonists established an organization "for the relief of distressed Germans." Over the course of its 250-year history, the Society has evolved with the changing needs of the German-American population of Philadelphia. During the 1800s, the Society continued its support for immigrants in need while also increasingly sponsoring activities to preserve and promote German traditions and customs. Today, the Society's membership and programs are open to anyone with an interest in the German language and culture. Initially, the Society focused its activities on helping Germans who arrived in Philadelphia under the indenture system, which required them to work off the cost of their voyage. In 1765, the Society successfully lobbied for legislation that protected these immigrants from exploitative contracts or abusive employers. It also provided newcomers with interpreters, financial assistance, and legal aid. A spike in German immigration in the late 1840s caused the Society to establish the Agentur (relief agency), which helped applicants with medical care, shelter, transportation, cash, and employment referrals. When the Women’s Auxiliary was founded in 1900, the Agentur shifted its focus to assisting single men find employment, while the Auxiliary helped entire families. With the outbreak of World War I, the Society and the Women’s Auxiliary expanded their relief efforts to include displaced Germans in Europe – an outreach that was repeated during World War II and the postwar years. Today, the Women’s Auxiliary leads the Society’s charitable mission by raising funds for a variety of Philadelphia-area non-profits. Education has been an important focus of the German Society for much of its existence. Beginning in the 1780s, the Society provided financial assistance to young German men attending the University of Pennsylvania. In 1817, the Society established a Volksbibliothek, a lending library that offered members general interest and educational reading materials both in German and English. Today, the library holds the largest non-university collection of German materials in the United States, ranging from language primers to popular novels. An estimated 20% of these books cannot be found at other American libraries. In the 1860s, the Society launched a lecture series on German-American topics, and it started an Abendschule (night school) offering English language instruction for German speakers. As demand for English classes for recent immigrants waned over the course of the 20th century, the Society’s educational offerings shifted to German language classes, both for adults and children. In addition, since the 1970s, it has provided over 250 scholarships for students from the tri-state area studying German in college. At the beginning of the 20th century, World War I, Prohibition, and the Great Depression presented the German Society and Philadelphia’s large German community with serious challenges. Following American entry into the war, the Society responded to strong anti-German sentiments by purchasing Liberty Bonds and organizing fundraising efforts for the Red Cross. Still, the fear of being identified as “un-American” caused a sharp drop in membership. After 1919, Prohibition devastated the local German brewing industry and ended many of the social customs that German-Americans had enjoyed. These factors, combined with restrictive immigration laws and the Great Depression, resulted in a decline of the Society’s status and influence. The outbreak of World War II continued the downward trend, although the remaining members mounted impressive war-related fundraising campaigns. After 1945, a surge in immigration from Germany reinvigorated the Society and completed its transformation into a cultural heritage organization. During the 1950s and 60s, the Society became an important focal point for the effort to re-establish the German-American presence in Philadelphia, culminating in the 200th Anniversary festivities of 1964. At the same time, German-Americans participated in the overall trend to leave city neighborhoods for the suburbs, making the building on Spring Garden less attractive for socializing. Many discussions were held about relocating to areas closer to where the Society members lived, but in the end, nobody wanted to give up the auditorium, with its superb setting for concerts, or the library, which at 70,000 volumes would have been much too large to take along. Simultaneously, the approaching 300th anniversary of the 1683 arrival of the first German settlers in Philadelphia sparked renewed interest on both sides of the Atlantic Ocean in the Society and its library, in the end allowing the Society to embark on an ambitious renovation project in the 1990s, funded by German and American government agencies and foundations as well as the Society itself. Since then, the library serves as a research center for German-American studies, and an expanding language program as well as new social events like a popular Bierfest have made it possible to gain new members from the region as a whole, not only its German-American community. At the beginning of the 21st century, the German Society is well poised to offer cultural, social, and educational experiences to a variety of audiences, whether they are recent immigrants, longstanding inhabitants of the area, or anybody interested in the German language and culture. None of this would be possible without the dedicated volunteers that have kept the Society going for over 250 years, a tradition that will hopefully continue for a very long time!